By Anne Lamott. Riverhead Books, 2014. 287 pages. $22.95/hardcover; $11.99/eBook. Sitting down to read one of Anne Lamott’s books is like taking a seat in the bleachers at your local county racetrack. As a battered ’54 Chevy careens down the track at what seems like 110 mph, your senses spike to full alert. Will a wheel fly off into the stands as the car enters the final turn? Will the car hit an oil slick, slide into another junker, and smash into the retaining wall in front of your seat? Or will it get rammed from behind by that tank of a ’64 Chrysler and flip into the evening sky? Whatever the sequence of events, you know it’s likely there will be shattered emotions, gut‐wrenching pain, and a river of tears. Grief, as I read somewhere once, is a lazy Susan. One day it is heavy and underwater, and the next day it spins and stops at loud and rageful, and the next day at wounded keening, and the next day at numbness, silence. I was hoarse for the first six weeks after Pammy died and my romance ended, from shouting in the car and crying, and I had blisters on the palm of one hand from hitting the bed with my tennis racket, bellowing in pain and anger. Few of us would be so unrestrained, possibly because few of us could so accurately identify—or express—the depth of our feelings. But Lamott walks through the world like an uninsulated nerve, open to every emotion in every person around her. And that thin line between her and everyone else—plus a scintillating intelligence—forces her to take in every experience, think about it, poke at it, probe it, internalize it, then, with brutal honesty, share how it feels to walk through it. Whether it’s life with a needy, demanding mother; a walk with a dying friend; separation from a brother; criticism from her father; marching with protesters in San Francisco; or living through George Bush’s idea of a presidency, Lamott rips down the shields we often place between ourselves and others, lets us see the reality of the relationship, and shows us how she’s come to terms with it so that she doesn’t drink or slit her wrists. It’s painful to read Small Victories. 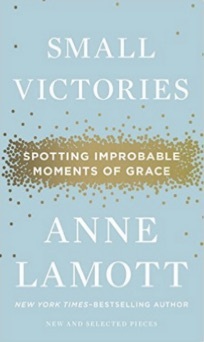 But in essay after essay, in an often barely controlled stream‐of‐consciousness that careens between fear, recklessness, and illumination, Lamott allows us to see the flesh and blood of her search for life’s meaning, and a search for that infinitesimal flash of insight that allows her to perceive God’s loving grace in the midst of human anguish. It is her gift to us that, in sharing that moment of perception—that small victory of the human spirit—she steps into the Presence and draws each of us in with her.